During its advance west from the surveyed drome, the 186th Infantry had met little opposition after 2 June.1 While it is inconceivable that the Biak Detachment had not anticipated the possibility of an American flanking maneuver through the inland plateau, there are many possible explanations for the failure of the Japanese to oppose this movement strongly after the initial battle at the surveyed drome. Colonel Kuzume and General Numata had reason to believe that the Americans might make an amphibious attack at Mokmer Drome. Small craft of engineer and artillery units attached to the HURRICANE Task Force continuously patrolled along the coast west of Bosnek to Sorido, and Seventh Fleet fire support vessels kept up harassing fires on all known and suspected enemy installations in the airfield area. Therefore, the Biak Detachment kept the 2d Battalion, 222d Infantry, and most of the armed service personnel immobilized on the low ridge and terraces north of Mokmer Drome and at the West Caves. Colonel Kuzume's principal responsibility was the defense of the airfields. While the best defense is usually a good offense and while it is often more sensible to defend an area from a distance, the Biak Detachment had strength neither to launch a large-scale offensive nor to defend every approach to the airfields. The attacks against the 162d Infantry on 28 and 29 May had resulted in the loss of most of the Biak Detachment's armor and had cost the 2d Battalion, 222d Infantry, many casualties, including its commander. Colonel Kuzume could ill afford any more such Pyrrhic victories. The 1st Battalion, 222d Infantry, had made no serious attempt to stop the 186th Infantry's progress westward because the inland plateau was nearly indefensible and because the battalion would have been decimated in battle with the superior strength of the reinforced American regiment. The 1st Battalion was withdrawn from the surveyed drome area on 2 June, initially in preparation for counterattack against the Bosnek beachhead. While no such counteroffensive was mounted, the withdrawal of the 1st Battalion at least had the advantage of keeping the unit intact. Caves area, after a long march through the jungle and rising ground north of the inland plateau. Colonel Kuzume and Headquarters, Biak Detachment, reached the West Caves during the night of 9-10 June, and the 1st Battalion began closing in the same area the next day. On the evening of 9 June, General Numata transferred the control of further operations on Biak to Colonel Kuzume. The general left next day for Korim Bay, whence he was evacuated by seaplane and returned to the 2d Area Army's command post at Manado, in the Celebes. Colonel Kuzume knew that as long as he could hold the low ridge and terrace north of Mokmer Drome, he could prevent the HURRICANE Task Force from repairing and using that field or Borokoe and Sorido Dromes. To conduct his defense he had under his control north of Mokmer Drome by the evening of 10 June the remaining elements of the 1st and 2d Battalions, 222d Infantry, totalling about 1,200 men; most of his armed service troops; the bulk of the 19th Naval Guard Unit; and most of the field and antiaircraft artillery pieces, mortars, and automatic weapons still serviceable. Some naval troops and a 222d Infantry mortar unit manned the East Caves positions, while the 3d Battalion, 222d Infantry, remained isolated at the Ibdi Pocket. Even without the Ibdi Pocket and East Caves groups, the Biak Detachment was well disposed to conduct a stubborn defense of the airfields, as the HURRICANE Task Force was soon to learn. On the morning of 8 June the 186th Infantry consolidated its positions around Mokmer Drome and cleared a number of small caves on a coral shelf located along the water line.2 At 0830 the 2d Battalion, 162d Infantry, started to move east to rejoin its parent regiment. The battalion had marched scarcely 800 yards east of Mokmer Drome when it was pinned down by Japanese automatic weapons and mortar fire from the East Caves. Finally, the 81-mm. mortars of Company D, 186th Infantry, from emplacements near Sboeria, stopped enough of the Japanese fire to permit the 2d Battalion to push on. Company G, 186th Infantry, was sent northeast from Mokmer Drome to find the source of the Japanese fire and to protect the left of the 162d Infantry's Battalion. The latter dug in for the night only a few yards east of the point where it had first halted, while the 186th Infantry's company set up defenses on the main ridge north of the East Caves. On the west flank the 3d Battalion, 186th Infantry, also had some trouble during the night. Shortly after dark, Japanese mortar fire began falling on the elements of the battalion dug in north of the coastal road, and later this fire shifted to the battalion positions south of the road. By either accident or design, a number of native dogs, running around and barking outside the battalion perimeter, helped the Japanese locate the unit's lines and, about 2100, as the enemy mortar fire moved eastward, troops of the 2d Battalion, 222d Infantry, attacked from the west and northwest. A few Japanese managed to infiltrate the battalion's outposts and several American soldiers were bayoneted before the battalion's 60-mm. mortars, together with machine gun and rifle fire, broke up the Japanese attack. The Japanese continued to harass the perimeter until 0530. Japanese losses were 42 counted dead, while the 3d Battalion, 186th Infantry, lost 8 killed and 20 wounded. Total casualties for the 186th Infantry and attached units during the night were 13 men killed and 38 wounded. On the morning of 9 June Company B, 186th Infantry, was sent from the beachhead to a point on the low ridge directly north of the center of Mokmer Drome to clear that ridge westward 1,200 yards and secure the point at which a motor road ran northwestward over the ridge. It soon became evident that the company was trying to bite off more than it could chew. Hardly had the leading platoon arrived atop the low ridge than it was pinned down by Japanese machine gun fire and then almost surrounded by Japanese infantry. When Japanese patrols threatened the rear of the company, all elements were withdrawn 400 yards south to set up a new base, from which patrols moved along the foot of the ridge in an attempt to determine the extent of the enemy's defenses. Results were inconclusive, and at dusk the unit moved back to the beachhead. It could report only that the low ridge was strongly held. Meanwhile, another company patrolled northeast to the point at which the regiment had crossed the main ridge, and established contact there with units of the 163d Infantry, which had pushed over the inland plateau behind the 186th. Tank-infantry patrols were sent west along the beach from Sboeria. A few bunkers and some small ammunition dumps were destroyed, but few Japanese troops were seen and there was no opposition. On the east flank, Japanese fire from the East Caves again kept the 2d Battalion, 162d Infantry, immobilized. Patrolling by elements of the 162d, 163d, and 186th Infantry Regiments in the East Caves area was productive of little information concerning the location of the principal Japanese positions. was able to move on eastward. But before that battalion had gone very far, and before the 1st Battalion, 186th Infantry, could mount another attack against the low ridge, Headquarters, HURRICANE Task Force, had evolved a new plan of operations. 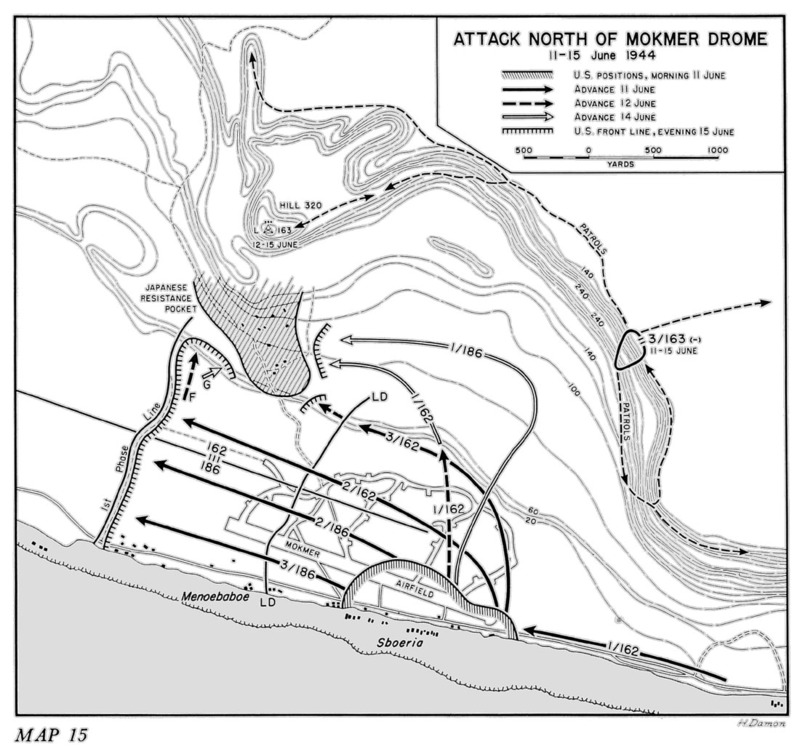 During the period 7-10 June little progress had been made in securing the Mokmer Drome area, and aviation engineers, brought forward by water from Bosnek on the 9th and 10th, had so far been unable to work on the strip because it was still exposed to Japanese fire from the low ridge and terrace north of the field. General Fuller had therefore decided to throw two infantry regiments against the enemy defenses north of the field. For this purpose the 2d Battalion, 162d Infantry, was returned to regimental control, and the remainder of the 162d Infantry started westward from the Parai area toward Mokmer Drome. On 7 June, when the 186th Infantry reached Mokmer Drome, it became a matter of urgency to open an overland line of communications to the airfield area. The 186th Infantry could be supplied overwater with some difficulty, but overland movement was faster and more efficient. Therefore General Fuller initially decided to outflank the enemy's positions in the Parai Defile by a drive from west to east along the cliffs above the road through the defile. For this purpose two companies of the 3d Battalion, 162d Infantry, were to be transported overwater from Ibdi to the Parai Jetty, whence they were to drive east in conjunction with a westward push by the rest of the battalion. On 7 June the proposed landing area at Parai Jetty (but not the jetty itself) was subjected to artillery and naval preparation fires. Three LVT(A)'s and eighteen LVT's picked up Companies I and K (reinforced) at the 3d Battalion position. They moved far out in the stream to avoid enemy mortar or artillery fire and, at 1315, started moving inshore toward the jetty. The first wave was delayed when two LVT's stuck on the reef fronting Parai, and the first amphibian tractors did not reach the beach until 1420. Fifteen minutes later, both the reinforced companies were ashore. As soon as the two companies landed they came under fire from Japanese weapons in the East Caves and along the ridge between that position and the Parai Defile. They then called for reinforcements. The Cannon Company arrived at the jetty about 1610 and six tanks of the 603d Tank Company reached the area about 1730. Patrols were then sent into the Parai Defile, meeting opposition which steadily increased as they moved eastward. A concerted drive could not be organized before dark, and plans had to be made to continue the attack on the morrow. Meanwhile, General Fuller had evolved his plan to move all the 162d Infantry to the Mokmer Drome area. By this time it had become evident that the 1st Battalion had isolated the principal remaining enemy strong points in the Ibdi Pocket and the task force commander had decided to leave only one company as a holding force in that area to prevent the Japanese from cutting the coastal road. The remainder of the 1st and 3d Battalions were to move to Parai and push west toward Mokmer Drome to establish contact with the 186th Infantry and the 2d Battalion, 162d Infantry. 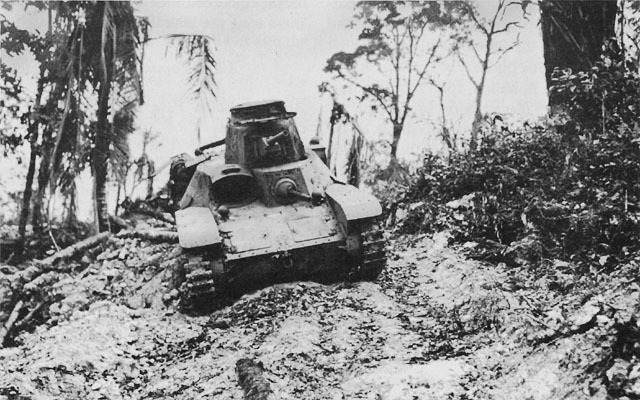 At 0900 on 8 June, Companies C, I, and K, supported by tanks, began moving west from Parai into the ground where the Japanese had counterattacked the 162d Infantry on 28 and 29 May. Company C advanced along the coastal road, while Companies I and K pushed up the low cliff at the coast from Parai to Mokmer village and attacked along the terrace above Company C. By noon, when they stopped to lunch and rest, the three companies were within 500 yards of Mokmer village and in the coconut grove through which the Japanese had launched the 29 May tank attack. At 1330, just after the advance companies had resumed their attack, they were pinned down by heavy mortar fire from the East Caves. Another infantry company was requested, and Company B moved forward to the right of the units on the terrace. There were indications that the enemy was preparing a counterattack similar to the one he had launched in the same area ten days earlier, but such an offensive did not develop. Meanwhile, it had been discovered that the Japanese had mined the main road west from Parai. Tank progress was slowed as the mines (most of them actually 6-inch naval shells) were removed or the vehicles guided around them. As the tanks approached Mokmer village, they came under mortar and automatic weapons fire from the East Caves. Since these weapons were masked by trees, the tanks were unable to deliver counterbattery fire against the enemy positions and were finally forced to seek cover. Continuing mortar and small arms fire made the forward units of the 162d Infantry seek shelter also and they dug in for the night along a curving perimeter which began on the beach 500 yards east of Mokmer and stretched northeastward some 800 yards almost to the base of the main ridge. A gap of about 1,800 yards remained between these forward companies and the 2d Battalion, 162d Infantry, west of Mokmer. MEN OF THE 162D INFANTRY seeking cover as they move westward along the shore. during the day, had not moved far beyond its bivouac of the previous night. On 10 June Company L and rear detachments of the 3d Battalion were moved forward by small craft to Parai. The 2d and 3d Battalions then began moving west along the coastal road to Mokmer Drome while the 1st Battalion was left at Parai with the mission of defending that area and clearing the remaining enemy from the Parai Defile. West from Mokmer village the coastal road was still subjected to heavy interdictory fire from the Japanese in the East Caves. Therefore, the 2d and 3d Battalions had to move along the beach under the protection of a low coral shelf. The march was accomplished in column of files and most of the troops waded through the edge of the surf, which was waist deep much of the way. The movement therefore progressed very slowly, and it was not until 1600 that the two battalions reached an assembly area at the eastern end of Mokmer Drome. The next day there began a new offensive which was aimed at clearing the Japanese from the ridges and terraces north and west of the airfield. with two regiments abreast, the 162d Infantry on the right, or north. The line of departure began on the beach at Menobaboe, whence it ran north-northeast through the western end of Mokmer Drome and over the low ridge. The boundary between regiments paralleled the coast and lay about 400 yards north of Mokmer Drome's main runway. The first objective was a first phase line lying about 1,350 yards beyond the western end of the runway. A second phase line was roughly 1,000 yards farther west and included Borokoe village, on the beach some 2,300 yards west of Menobaboe. The inland end of the second phase line lay about 2,000 yards north of the coast. Occupation of the third phase line would bring the two attacking regiments into line with the eastern end of Borokoe Drome. to about 120 effectives; a company or two of the 2d Battalion, 222d Infantry; elements of various engineer units, fighting as infantry; and some field and antiaircraft artillery weapons and crews. All in all, there were probably some 600-700 Japanese along the ridge. ridge on the battalion's right. The unit therefore did not reach the first phase line until 1620. The two 186th Infantry battalions dug in for the night about 600 yards apart, both on the east side of a trail marking the first phase line. The terrain there was solid coral with only a thin layer of topsoil covering it. In such ground three hours was the minimum time a man needed to prepare a satisfactory slit trench, and darkness arrived before all the units could dig in. Colonel Newman therefore recommended that on subsequent days forward movement cease at 1500 so that time would be available to prepare night defenses and to undertake essential evening reconnaissance. This recommendation was approved by Headquarters, HURRICANE Task Force. 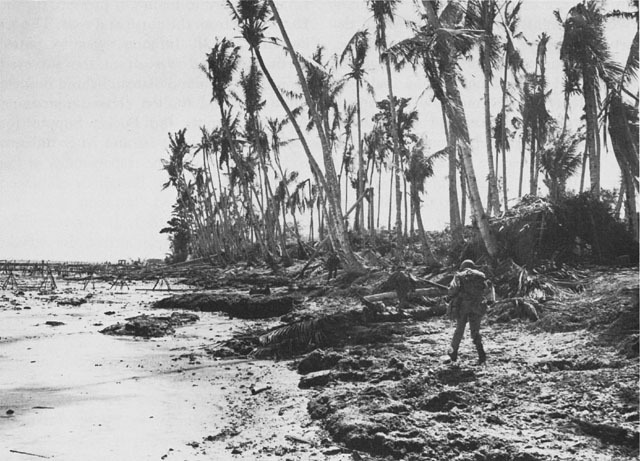 For the night of 11-12 June, the headquarters of the 186th Infantry, the 1st Battalion, and an advanced command post of the HURRICANE Task Force dug in at Sboeria village, on the beach south of Mokmer Drome. Company G, 186th Infantry, came down off the ridges near the East Caves during the day and set up its bivouac at Sboeria. At the same location were the Cannon and Service Companies, 186th Infantry, and the 863d Engineer Aviation Battalion, which was responsible for repairing Mokmer Drome. In the 162d Infantry's zone of responsibility, the day's action had been marked by stubborn Japanese resistance. The 3d Battalion, trying to gain the top of the low ridge and to move west along that ridge to the line of departure, was halted and forced to seek cover almost the moment it started to move. Even with support from the 947th Field Artillery Battalion, it was midafternoon before the battalion's attack really got under way. Then the unit found that the terrain along the top and southern slope of the low ridge was rough and covered by dense rain forest and thick scrub growth. Visibility and maneuver room were severely limited, and the Japanese defenders made excellent use of every advantage the terrain offered. The 2d Battalion had been halted about 600 yards short of the line of departure to await the outcome of the 3d's efforts, but about 1245 was ordered to push on. The 2d Battalion reached the line of departure about 1320 and moved on to the first phase line, drawing abreast of the 2d Battalion, 186th Infantry, at 1720. The 3d Battalion fought doggedly forward during the afternoon, discovering an ever increasing number of Japanese pillboxes, bunkers, and hasty automatic weapons and rifle emplacements of all kinds. Dusk found the unit still some 100 yards short of the line of departure and about 1,300 yards east of the 2d Battalion. The 1st Battalion, taking no part in the action during the day, moved forward to Mokmer Drome from Parai. For 12 June, Colonel Haney planned to put his 2d and 3d Battalions on the low ridge, while the 1st took over the 3d's positions near the line of departure and patrolled west, north, and east. During the afternoon of the 11th, the 162d Infantry had learned from Javanese slave laborers who had come into the lines that the Japanese headquarters installations were located in large caves approximately 1,000 yards northwest of the 3d Battalion's lines. This, apparently, was the first information obtained by the HURRICANE Task Force concerning the enemy's West Caves stronghold. The significance of the information was not yet realized, but the 1st Battalion, 162d Infantry, was ordered to patrol north on the 12th to attempt to confirm the Javanese reports. In order to permit the 162d Infantry to place more troops on the ridge, the 186th Infantry was instructed to assume responsibility for an additional 300 yards on its right flank. On the 12th that regiment was to advance as far as the second phase line, maintaining close contact with the 162d Infantry. The latter was also expected to reach the second phase line, but no advance beyond that line was to be undertaken until Headquarters, HURRICANE Task Force, so ordered. On the morning of the 12th, the 186th Infantry had already started moving toward the second phase line when, at 0830, it received orders to halt until the 3d Battalion, 162d Infantry, could reach the first phase line. Although no Japanese were to be found in the 186th Infantry's sector, an advance by that regiment without concurrent progress by the 162d Infantry would leave a large and dangerous gap in the lines. Through such a gap the enemy could move to outflank and cut off the 162d Infantry. But the 162d Infantry was able to make little progress during the day. As a result, the 186th Infantry remained on the first phase line and limited its operations to patrolling. The 2d Battalion, 162d Infantry, had started moving both toward the low ridge and westward about 0830, but it also had been halted until the 3d Battalion could fight its way up to the first phase line. The 3d Battalion sent Company L north of the ridge to outflank troublesome Japanese positions while the rest of the battalion continued a frontal assault. But Japanese resistance was even stronger than it had been the previous afternoon, and the battalion was again unable to make any progress. At 0940 it pulled back some 300 yards southeast of its previous night's bivouac to allow Company M's 81-mm. mortars to lay a concentration on enemy bunkers and foxholes at the point where the line of departure crossed the low ridge. At 1035 the advance was resumed with Company I on the ridge, Company L on the terrace north of I, and Company K along the ridge slopes south of I. Company K moved forward 200 yards by 1100, having encountered little opposition, and then halted to wait for the other two companies to draw up. Company I, meanwhile, had found that the mortar fire had been effective but that new Japanese positions were located west of the mortar impact area. From 1100 to 1130 the company fought its way through these second defenses, but no sooner had it broken through when a third set of positions was discovered 50 yards farther west along the ridge. It was also learned that a fourth strong point was located beyond the third. Company L, north of the ridge, met few Japanese and by 1230 had passed through some minor opposition to a position north of but opposite Company K. Company L then cautiously probed southwestward and southward to locate the flanks and rear of the positions in front of Company I. Meanwhile, Company L, 163d Infantry, had established an observation post on Hill 320, a high point on the main ridge about 1,500 yards northwest of the lines of the 3d Battalion, 162d Infantry. At 1530 this observation post reported that Japanese were occupying a number of antiaircraft gun positions along the low ridge west of the 162d Infantry unit. Fearing immediate enemy artillery fire, the 162d Infantry withdrew all its troops from the low ridge into defilade positions. returned to the low ridge. By nightfall Company L was dug in on the ridge about 300 yards west of the line of departure, and Company I was almost 100 yards to the east. In order to prevent the Japanese from reoccupying their defensive position near the line of departure--positions which had been so laboriously cleaned out during the day--two platoons of Company K moved into the vacated enemy defenses. The rest of Company K, together with 3d Battalion headquarters and Company M, remained south of the ridge about 400 yards east of the line of departure. During the late afternoon the 2d Battalion had sent a number of patrols north from its position on the first phase line to the low ridge, and Company F set up night defenses on the ridge at the point where the first phase line crossed. A gap of almost 900 yards, in which were many strong Japanese defenses, separated Company F from Company L. For the next day, plans were made for the 162d Infantry to close this gap while the 186th Infantry remained in position along the first phase line. The 162d Infantry resumed its attack about 0730 on 13 June when Company L started pushing east and west along the low ridge in an attempt to establish contact with both the 2d Battalion and Company I. Contact was made with the latter unit about 1300, after a small Japanese pocket had been cleaned out. Company K, meanwhile, had been forced to mop up a few enemy stragglers near the line of departure and had sent one platoon westward to help Company I. Late in the morning, the 1st Battalion moved on to the low ridge east of the 3d in order to protect the regiment's right and rear and relieve 3d Battalion troops from that duty. Though this realignment freed 3d Battalion units for a new drive westward, by the end of the day little progress had been made in closing the 900-yard gap between that battalion and the 2d. Not only had the 3d Battalion been unable to move westward, but 2d Battalion units had also been unable to make any progress eastward. During the 13th, the 186th Infantry had limited its activities to patrolling while it again awaited the outcome of the 162d's attack. The regiment had also provided local security for engineers who were working hard to repair Mokmer Drome. The engineers had begun steady work about 1030 hours on 12 June, and by evening of that day they expected to get the strip into shape for fighter aircraft before noon on the 13th. But work on the latter day was thrice interrupted by Japanese artillery or mortar fire, most of which originated along the ridge between the lines of the 2d and 3d Battalions, 162d Infantry. Despite these interruptions, about 2,300 feet of the eastern end of the airfield had been repaired sufficiently for use by fighter planes by evening of 13 June. More of the strip had been cleared, filled in, and prepared for final grading by the same time. The first plane to land on the field was an artillery liaison aircraft, which came down about 1000 hours on the 13th. Because of Japanese harassing fire, the airstrip still could not safely be used by larger planes. commander that the 3d Battalion, 162d Infantry, was becoming worn out and had already lost much of its effectiveness. To relieve the 3d Battalion, General Doe recommended sweeping changes in the attack plan which had been in effect since 10 June. He proposed that the 1st Battalions of the 162d and 186th Infantry Regiments move around the right flank of the 3d Battalion, 162d Infantry, to the terrace above the low ridge. Reports from friendly natives indicated that the Japanese were guarding a water hole--the last one remaining in the area--near a Japanese encampment about midway between the positions of Company L, 162d Infantry, on the low ridge, and those of Company L, 163d Infantry, on Hill 320 to the north. Although the HURRICANE Task Force had not yet located the West Caves, the reported existence of the water hole and other miscellaneous bits of information prompted General Doe to believe that a major enemy strong point existed near the Japanese encampment. He felt that if the new two-battalion attack succeeded in eliminating this strong point, the remaining enemy positions along the low ridge would be untenable and the Japanese might retire. Then the 3d Battalion, 162d Infantry, would not have to continue its attacks and, indeed, would be pinched out by the new advance and could revert to a reserve role. The 1st Battalion, 162d Infantry, was to move north over a trail which would take it through the rear of the 3d Battalion. When the 1st Battalion had reached a point on the terrace about 500 yards north of the low ridge, it was to turn and attack to the west and southwest. The 1st Battalion, 186th Infantry, was to follow a trail leading north from the eastern end of Mokmer Drome and, making a wider envelopment, was to follow an azimuth taking it east of the 1st Battalion, 162d Infantry. Then it was to draw up on the right of the latter, ready to attack westward. For the 1st Battalion, 162d Infantry, operations on 14 June began about 0600 when Company B, at the base of the low ridge about 800 yards east of the 3d Battalion's lines, was attacked by about fifteen Japanese infantrymen. Within ten minutes nine Japanese were killed, but patrolling and reorganizing after the attack delayed the battalion's movement to the line of departure for the new attack. Following the infantry assault, the Japanese began to throw antiaircraft, small arms, and mortar fire into the American unit's positions, keeping it pinned down on the southern slopes of the low ridge until 1100. The battalion was further delayed when American artillery fire was placed on Japanese troops seen maneuvering on the terrace north of the 3d Battalion. Meanwhile, the 1st Battalion, 186th Infantry, had also been delayed. The 162d Infantry unit had to wait for the 186th's battalion to come into line before the attack westward could begin. 162d Infantry. Then it moved northeast over the terrace along a rough trail leading toward the main ridge-crossing employed by the 186th Infantry on 7 June. First contact with the enemy came at 0930, when Company C killed two Japanese on the trail about 800 yards north of the low ridge. The march continued until 1030 when, as the units began to turn westward, Company C was pinned down by fire from rising ground 100 yards east of the trail. Company A patrols undertook to stop this fire, but it was two hours before the advance could be continued. Only 400 more yards had been gained by 1300 when the advance was again held up by a small group of Japanese dug in across the trail. But this opposition was broken through within half an hour, and by 1430 Company C had moved another 800 yards west and was in line with Company B, 162d Infantry, 300 yards to the south. Both 1st Battalions now resumed the advance abreast. The 1st Battalion, 162d Infantry, continued to meet opposition on its right and front during the afternoon, and did not establish physical contact with the 186th Infantry's battalion until 1735. The 162d Infantry unit then dug in northeast of the West Caves and about 250 yards north of Company L, on the low ridge. The battalion's perimeter was about 400 yards short of its objective for the day, as was that of the 1st Battalion, 186th Infantry, now located on a slight rise 50-75 yards to the right rear of the 1st Battalion, 162d Infantry. Patrols sent out before dark brought back proof that the 1st Battalion, 162d Infantry, was on the periphery of the West Caves, now recognized by the HURRICANE Task Force as a major Japanese strong point. The task force G-2 Section estimated that the West Caves held about 1,000 Japanese, including naval and army headquarters. Colonel Kuzume, realizing full well the value of the West Caves position as a base for counterattacks, was determined to hold that area. At 1930 on the 14th, he sent available elements of the Biak Detachment against the two forward American battalions in an attempt to drive them southward and eastward away from the caves. A combined infantry-tank attack drove Company B of the 162d Infantry out of its semi-isolated position at the northwestern end of the 1st Battalion's perimeter. The company withdrew in an orderly fashion into the battalion lines. The Japanese now turned their attention to the 1st Battalion, 186th Infantry. Small Japanese groups, moving along a road which entered the battalion's perimeter from the west, harassed the unit all night. No attacks were pressed home, but the Japanese maneuvers were interpreted as presaging a more determined counterattack on the morrow. the gap between the two harassed battalions. In the ensuing melee, Company B suffered heavy casualties, for it had no weapons with which it could easily drive off the tank and stop its 37-mm. and machine gun fire. However, when the accompanying infantrymen were scattered by Company B's fire, the tank maneuvered out of range. At 1400 the same day, two more tanks advanced toward the 1st Battalion, 186th Infantry. The tanks again moved along the east-west road north of the caves but did not press home their attack. Apparently, no Japanese infantry accompanied these tanks. During the day three Japanese tanks were knocked out--two by bazookas of Company C, 186th Infantry, and the other by a combination of .50-caliber and small arms fire. The 121st Field Artillery Battalion, while it had hit no tanks, had proved a real aid during the battle. It prevented Japanese infantrymen from forming for the attack and neutralized a number of enemy machine guns by firing 600 rounds into the area northwest of the 1st Battalion, 186th Infantry. 3d Battalion. Once on the ridge, the 1st Battalion was to do an about-face and extend its left to the 2d Battalion's lines. The 1st Battalion, 186th Infantry, was to protect the rear of the 1st Battalion, 162d Infantry, during the latter's displacement southward. The new plan proved impossible of execution. Fighting in the area between the 2d and 3d Battalions, 162d Infantry, on the low ridge continued unabated all afternoon. Steady fire from friendly artillery and mortars, combined with Japanese automatic weapons and mortar fire from positions between the West caves and the low ridge, kept the 1st Battalion, 162d Infantry, pinned down much of the time and slowed its movement southward. The 2d and 3d Battalions continued to try to close the gap and managed to overrun or destroy a number of enemy defensive positions. They were unable to entirely clear the area, however, and by nightfall the gap was still some 500 yards wide and was apparently occupied by a strong enemy force which was well dug in. The 15th of June, on which date forces of the Central Pacific Area landed in the Mariana Islands, had come and gone, and still no planes of the Allied Air Forces, Southwest Pacific Area, had been able to support the Central Pacific's operations from an airfield on Biak Island. The 863d Engineer Aviation Battalion, which had managed to repair about 2,300 feet of Mokmer Drome by evening of 13 June, had been forced to stop work on the morning of the 14th, when Japanese fire on the strip became so intense that the engineers could not stay on the field and Allied planes could not use it. The 15th had ended on a note of frustration in the Mokmer Drome area. The Japanese still held part of the low ridge, and from their positions there and on the terrace to the north, could continue to prevent the Allies from using the Biak fields. Reconnaissance was made of Mios Woendi, Aoeki, and Owi Islands in the Paidado group by naval and engineer personnel of the HURRICANE Task Force on 1 June. The next day Company A, 163d Infantry, secured Owi and Mios Woendi, and a more detailed engineer reconnaissance of Aoeki and Owi was made a few days later. Aoeki proved unsuitable for an airfield, but Owi was found to be an excellent site. Beginning on 3 June, engineers, together with antiaircraft and radar units, were taken to Owi. Heavy artillery (155-mm. guns) was also set up on the island to support operations on Biak. The Owi Island strip was not ready in time to support Central Pacific operations and, despite expectations to the contrary, neither was any other field at Biak. The Wakde Island airfield had to bear a larger share of such support than had been planned. Moreover, the delay in making ready the fields on Biak threatened the speed of subsequent operations within the Southwest Pacific. The HURRICANE Task Force had failed in its principal mission--rapid seizure and repair of airfields from which the Allied Air Forces could support the Mariana operation and further advances along the New Guinea axis. General Eichelberger arrived at Biak late on the morning of 15 June and at 1230 assumed command of the HURRICANE Task Force.24 It was an angry and unhappy General Fuller who greeted General Eichelberger at Bosnek. The division commander felt that General Krueger had been unjustifiably critical of the operations on Biak, and he believed that his relief as task force commander indicated that his services had proved unsatisfactory to his superiors. General Fuller had already requested in a letter to General Krueger that he be relieved of the division command as well as that of the task force and he asked for reassignment outside the Southwest Pacific Area. To the Officers and Men of the Forty-first Infantry Division. I am being relieved of command for my failure to achieve the results demanded by higher authority. This is in no way a reflection upon you or your work in this operation. I, and I alone, am to blame for this failure. I have commanded the Forty-First Division for better or worse for over two years and one-half. During that period I have learned to respect you, to admire you, and to love you, individually and collectively. You are the finest body of men that it has been my privilege to be associated with in thirty nine years of service. 1. Information in this subsection is from: MID WD, Military Reports, 24, pp. 15-18; G-2 HTF, G-2 Hist of HTF, Vol. I, Part II, Enemy Opns, pp. 7-9; G-2 HTF Per Rpts 10-15, 4-10 Jun 44, in G-2 Hist of HTF, Vol. II, Part II, Per Rpts; Opns of Yuki Group, pp. 7-9; 2d Army Opns at Sarmi and Biak (Rev), pp. 72-80. 2. This subsection is based principally on: 186th Inf Jnl, 27 May-20 Aug 44; 162d Inf Jnl, 22 May-19 Aug 44; Co G 186th Inf Opns Rpt, 8-11 Jun 44, in Annex 17 to 186th Inf Opns Rpt Biak, 27 May-19 Aug 44; HTF G-3 Jnl, 15 May-21 Aug 44; HTF Opns Rpt Biak, 17 May-20 Aug 44, p. 10; 603d Tank Co Opns Rpt Biak, p. 4. 3. Company H, 162d Infantry (the heavy machine guns and 81-mm. mortars), had not gone over Young Man's Trail with the 2d Battalion on 2 June but had rejoined the battalion on the inland plateau on or about 5 June, after it had marched overland from Ibdi, through Opiaref, and west along the inland road. The original commander of the Japanese unit had been killed in action on the coast at the end of May. 4. Information in this subsection is based principally on: 162d Inf Opns Rpt Biak, 15 May-19 Aug 44, pp. 6-8; 162d Inf Jnl, 22 May-19 Aug 44; Co B 162d Inf, Diary of B Co in Biak Campaign, in ORB RAC AGO collection; 603d Tank Co Opns Rpt Biak, pp. 3-4; Co A 186th Inf, Rec of Events, 17 Apr-6 Jul 44, in ORB RAC AGO collection; Antitank Co 186th Inf, Rec of Events, 19 Apr-17 Jul 44; HTF G-3 Jnl Biak, 15 May-21 Aug 44; HTF Opns Rpt Biak, 17 May-20 Aug 44, pp. 9-10; 542d EB&SR Opns Rpt Biak, p. 11. 5. See Ch. XVI below. 6. 162d Inf FO 3, 10 Jun 44, atchd to 162d Inf Opns Rpt Biak, 15 May-19 Aug 44; Jnl entry, 1310, 10 Jun 44, in 186th Inf Jnl, 27 May-20 Aug 44; 121st FA Bn Opns Rpt Biak, pp. 4-6; 205th FA Bn Opns Rpt Biak, pp. 5-6; 947th FA Bn Opns Rpt Biak, p. 6. 7. 163d Inf Jnl, 31 May-19 Aug 44; Jnl entry, 1310, 10 Jun 44, in 186th Inf Jnl, 27 May-20 Aug 44; 146th FA Bn Opns Rpt Biak, pp. 19-20. 8. This subsection is based principally on: 186th Inf Opns Rpt Biak, 27 May-19 Aug 44, pp. 17-19; 186th Inf Jnl, 27 May-20 Aug 44; Co G 186th Inf Opns Rpt, 8-11 Jun 44; HTF G-3 Jnl, 15 May-21 Aug 44; HTF Opns Rpt Biak, 17 May-20 Aug 44, pp. 10-11; 162d Inf Opns Rpt Biak, 15 May-19 Aug 44, pp. 7-8; 162d Inf, 8-2 Sit Overlays, 10-12 Jun 44; 162d Inf Jnl, 22 May-19 Aug 44; 121st FA Bn Opns Rpt Biak, p. 6; 2d Army Opns at Sarmi and Biak (Rev), pp. 74-75, 80. 9. This subsection is based upon: HTF G-3 Jnl, 15 May-21 Aug 44; HTF Opns Rpt Biak, 17 May-20 Aug 44, pp. 10-11; 186th Inf Opns Rpt Biak, 27 May-19 Aug 44, p. 9; 186th Inf Jnl, 27 May-20 Aug 44; History of First Battalion, One Hundred Eighty-Sixth Infantry (While Detached From Regimental Control) Mission with 162d Infantry, 13 June-18 June, pp. 1-2 (hereafter cited as 1st Bn 186th Inf, Hist with 162d Inf, 13-18 Jun 44), in Annex 23 to 186th Inf Opns Rpt Biak, 27 May-19 Aug 44; 121st FA Bn Opns Rpt Biak, pp. 6-7; 205th FA Bn Opns Rpt Biak, p. 7; 162d Inf Opns Rpt Biak, 15 May-19 Aug 44, pp. 8-9; 162d Inf Jnl, 22 May-19 Aug 44; Co B 162d Inf, Diary in Biak Campaign; Opns of Yuki Group, pp. 8-9; G-2 HTF, G-2 Per Rpts 18-21, 23-16 Jun 44, in G-2 Hist of HTF, Vol. II, Part II, Per Rpts; 2d Army Opns at Sarmi and Biak (Rev), pp. 80-81. 10. Rad, ALAMO Rear Hq to ALAMO Adv Hq, WF-5272, 30 May 44, and Rad, HTF to ALAMO, TF-111, 31 May 44, both in ALAMO Adv Hq G-3 Jnl Wakde-Biak, 30 May-1 Jun 44. 11. Rad, ALAMO Rear Hq to ALAMO Adv Hq, WH-4263, 25 May 44, in ALAMO Rear Hq G-3 Jnl Wakde-Biak, 24-26 May 44; Rad, ALAMO Rear Hq to HTF, WH-136, 27 May 44, in ALAMO Adv Hq G-3 Jnl Wakde-Biak, 27-28 May 44; Ltr OI, Comdr ALAMO Force to CG USF APO 920 [Comdr HTF], 28 May 44, in G-3 GHQ Jnl, 28 May 44. 12. 542d EB&SR Opns Rpt Biak, pp. 7-9; HTF G-3 Jnl, 15 May-21 Aug 44; 163d Inf Jnl, 31 May-19 Aug 44; Rad, ALAMO Rear Hq to GHQ SWPA, WF-1228, 6 Jun 44, in ALAMO Adv Hq G-3 Jnl Wakde-Biak, 67 Jun 44; Rad, ALAMO Rear Hq to GHQ, SWPA, WF-1521, 8 Jun 44, in ALAMO Adv Hq G-3 Jnl Wakde-Biak, 8-9 Jun 44; Rad, ALAMO Rear Hq to GHQ SWPA, WF-2105, 10 Jun 44, in ALAMO Adv Hq G-3 Jnl Wakde-Biak, 10-11 Jun 44; Rad, ALAMO Rear Hq to HTF, WF-864, 5 Jun 44, in ALAMO Adv Hq G-3 Jnl Wakde-Biak, 5-6 Jun 44. Information on types of aircraft and dates they arrived at Owi was furnished by Capt. B. L. Mortensen, Air Hist Gr, Hq USAF, 22 Nov 48. 13. Rad, ALAMO Adv Hq to HTF, WH-39, 1 Jun 44, in ALAMO Adv Hq G-3 Jnl Wakde-Biak, 1-3 Jun 44; Ltr, Krueger to Ward, 2 Jan 51, no sub, in OCMH files. 14. Rad, GHQ SWPA to ALAMO, C-13275, 5 Jun 44 in ALAMO Adv Hq G-3 Jnl Wakde-Biak, 4-5 Jun 44. 15. Rad, ALAMO Adv Hq to HTF, WH-182, 5 Jun 44 in ALAMO Adv Hq G-3 Jnl Wakde-Biak, 4-5 Jun 44. 16. Rad, ALAMO Adv Hq to GHQ SWPA, WH-183, 5 Jun 44, in ALAMO Adv Hq G-3 Jnl Wakde-Biak. 4-5 Jun 44. 17. Memo, ALAMO AA Officer for CofS ALAMO, 6 Jun 44, sub: Obsn On Biak, and Memo, ALAMO FA Obsr Biak for Comdr ALAMO. 6 Jun 44, sub: Obsr's Rpt on Biak, 2-5 Jun 44, both in ALAMO Adv Hq G-3 Jnl Wakde-Biak, 8-9 Jun 44; Ltr, Doe to Ward, 4 Dec 50, and Ltr, Krueger to Ward, 2 Jan 51, both in OCMH files. 18. Rad, HTF to ALAMO Adv Hq, TD-544, 10 Jun 44, and Rad, ALAMO Adv Hq to HTF, WH-343, 10 Jun 44, both in ALAMO Adv Hq G-3 Jnl Wakde-Biak, 10-11 Jun 44. 19. Rad, HTF to ALAMO Adv Hq, TD-654, 13 Jun 44, in ALAMO Adv Hq G-3 Jnl Wakde-Biak, 13-14 Jun 44. 20. Rad, ALAMO Adv Hq to GHQ SWPA, WH-418, 13 Jun 44, in ALAMO Adv Hq G-3 Jnl Wakde-Biak, 13-14 Jun 44. 21. Ltr, Krueger to Ward, 2 Jan 51; Lt Gen Robert L. Eichelberger and Milton MacKaye, "Biak: Battle of the Caves," The Saturday Evening Post, CXXII, 10 (3 Sep 49), 26, 99; same, Our Jungle Road to Tokyo (New York, 1950), pp. 137-38. 22. Rad, ALAMO Adv Hq to HTF, WH-465, 15 Jun 44, in ALAMO Adv Hq G-3 Jnl Wakde-Biak, 14-15 Jun 44; ALAMO Force Opns Rpt Wakde-Biak, p. 43. 23. Ibid., Ltr OI, Comdr ALAMO Force to CG I Corps, 14 Jun 44, in ALAMO Adv Hq G-3 Jnl Wakde-Biak, 14-15 Jun 44. 24. Rad, HTF to ALAMO, TD-720, 15 Jun 44, in ALAMO Adv Hq G-3 Jnl Wakde-Biak, 14-15 Jun 44. 25. Gen Eichelberger, notes entitled "Background for the Biak Operation," dictated by the general, 4 Apr 48, copy in OCMH files; Eichelberger and MacKaye, Our Jungle road to Tokyo, p. 142; Rad, ALAMO Adv Hq to GHQ SWPA, WH-500, 16 Jun 44, Rad, HTF (personal from Gen Fuller) to ALAMO (for Gen Krueger), TD-746, 16 Jun 44, and Rad, HTF (from Gen Eichelberger) to ALAMO (for Gen Krueger), TD-762, 16 Jun 44, all three rads in ALAMO Adv Hq G-3 Jnl Wakde-Biak, 16-18 Jun 44. Ltr, Krueger to Ward, 2 Jan 51. 26. Ltr, CG 41st Div to O's and EM of 41st Inf Div, 16 Jun 44, no sub, certified true copy in 163d Inf Jnl, 31 May-19 Aug 44. 27. 186th Inf Jnl, 27 May-20 Aug 44; Eichelberger and MacKaye, Our Jungle Road to Tokyo, pp. 141-46; Eichelberger Notes; Ltr, Krueger to Ward, 2 Jan 51. 28. Memo, ALAMO AA Officer for CofS ALAMO Force, 6 Jun 44, sub: Obsns on Biak, and Memo, ALAMO FA Obsr, Biak, for Comdr ALAMO Force, 6 Jun 44, sub: Obsr, Rpt on Biak, 2-5 Jun 44, both in ALAMO Adv Hq G-3 Jnl Wakde-Biak, 8-9 Jun 44. 29. Newman Notes; Col Haney, commanding the 162d Infantry, agreed in Ltr, Haney to Ward, 20 Nov 50, with Col Newman's statement here. 30. HTF G-3 Jnl, 15 May-21 Aug 14; Opns of Yuki Group. pp. 8-9.